Adapted from our original Love Lace Stencil for my Kiwi friend Niki of Tuatara Treats over in Switzerland, this design will now fit another heart shaped cutter. 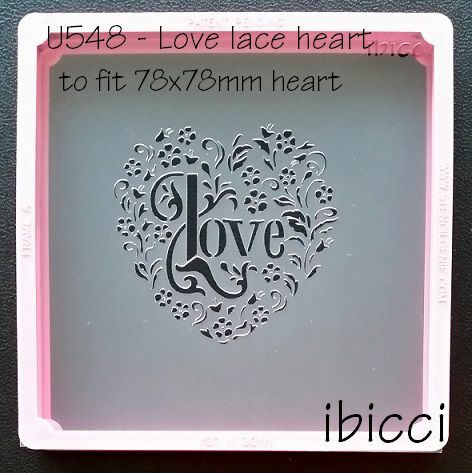 The 4" stencil will fit a stencil Genie, If you have a 5" heart cutter, the 5" is supplied on a landscape stencil for use with a Stencil Snap or magnets. The 6" (and larger if requested) will be supplied on a Cake sized stencil. IF YOU HAVE ANOTHER HEART YOU WOULD LIKE TO HAVE THIS DESIGN FOR, PLEASE DON'T HESITATE TO ASK! Kat is happy to custom fit the design for your own Heart cutter.